The World Economic Forum is celebrating its 25th anniversary in Asia this year, as it hosts the regional meet in Kuala Lumpur. The organisation prides itself on being able to provide a platform for governments, companies and civil societies to discuss issues pertaining to the region and the way forward. The Forum, which was earlier known as the East Asia Forum, now focuses on Asean, given its growing importance. WEF counts among its achievements the creation of the Asia-Europe Meeting (ASEM), which was first discussed at the Forum's third East Asia meeting here, in 1994. ASEM is an informal process of dialogue involving 28 European Union member states, two other European countries, 21 Asian countries and the Asean Secretariat. ASEM's first meeting was launched in 1996, by Singapore's Prime Minister then, Mr Goh Chok Tong and his French counterpart Edouard Balladur in Davos. WEF has also supported the establishment of a Disaster Resource Partnership (DRP), an international alliance of Engineering & Construction (E&C) companies. DRP has become a model for coordinated private sector partnership in response to natural disasters. It was launched at the Forum's meet in Jakarta in 2011, by Indonesia's then President, Dr Susilo Bambang Yudhoyono. Two years later, WEF was in Myanmar, hosting the first major international conference and encouraging its partners to pay attention to the country that had been isolated for over three decades. And last year, at the WEF meet in Jakarta, it launched Grow Asia, an initiative to assist small farmers in South-east Asia. Grow Asia is a multi-stakeholder partnership that aims to reach 10 million small farmers by 2020, helping them access knowledge, technology, finance, and markets to increase their productivity, profitability, and environmental sustainability by 20 per cent. 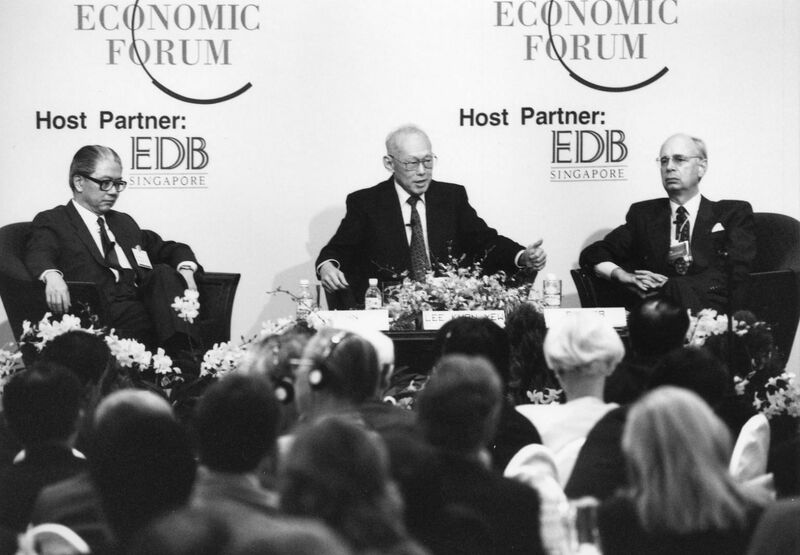 Klaus Schwab, Founder and Executive Chairman of the World Economic Forum, speaking with the then Singapore Prime Minister, Mr Lee Kuan Yew and Mr Tony Tan Keng Yam, the then Deputy Prime Minister of Singapore, at WEF's East Asia Economic Forum in Singapore, in 1994. It was the first time that the Forum was held in Singapore. Nearly 700 businessmen, bankers and academics attended the summit. 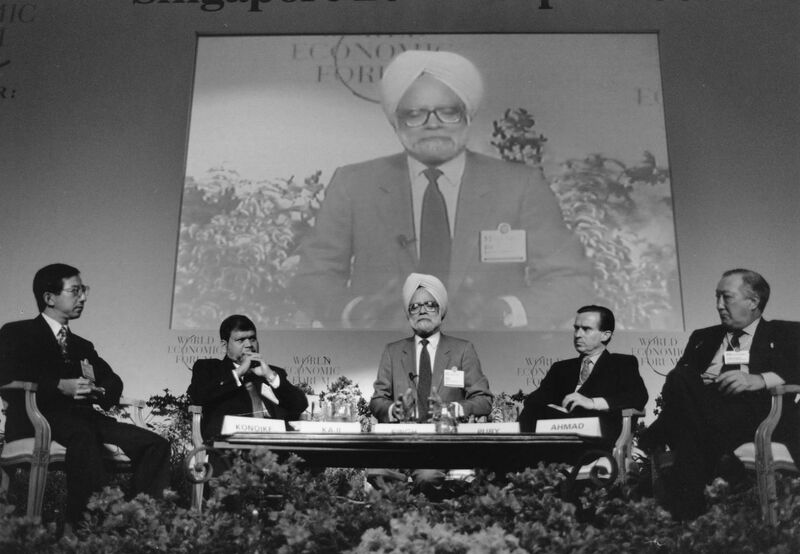 India's former Prime Minister Manmohan Singh speaking with other panellists at the WEF in Singapore in 1995. He was the Chairman of the Parliamentary Committee on Commerce in India, then. This was also the year that WEF marked its 25th global anniversary. 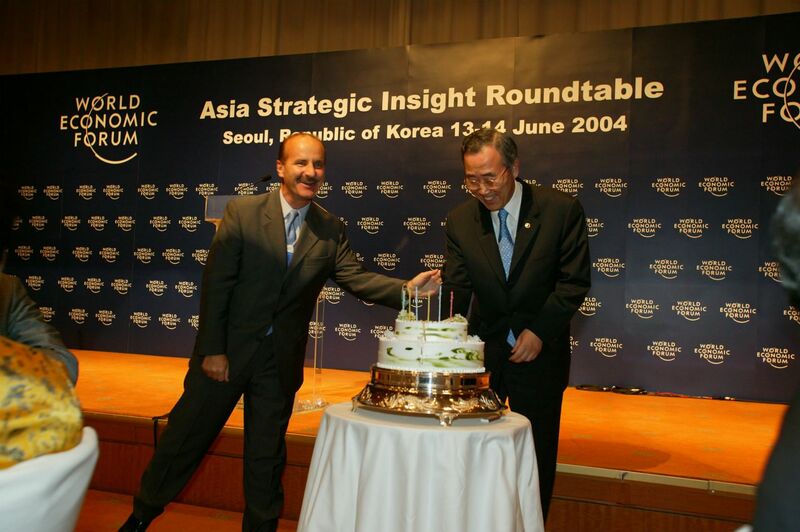 United Nations Secretary General Ban Ki-Moon, who was South Korea's Foreign Affairs Minister in 2004 celebrating his birthday on the sidelines of the Asia Strategic Insight Roundtable, organised by the WEF in Seoul, that year. Singapore Prime Minister Lee Hsien-Loong walks with delegates attending the WEF in Singapore, in 2007. Seen with him in the picture are Gloria Macapagal Arroyo, President of the Philippines and Carlos Ghosn, President and Chief Executive Officer, Renault. 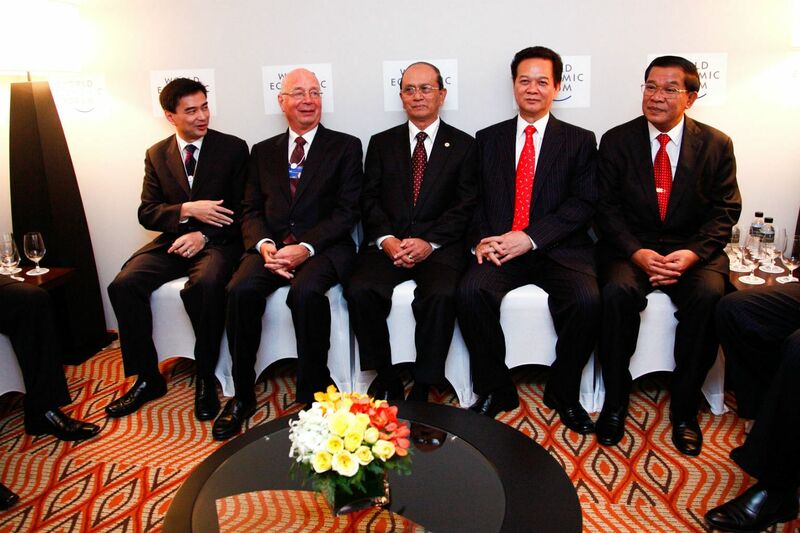 Abhisit Vejjajiva, Prime Minister of Thailand, Klaus Schwab, Executive Chairman, World Economic Forum, Thein Sein, Prime Minister of Myanmar, Nguyen Tan Dung, Prime Minister of Vietnam and Hun Sen, Prime Minister of Cambodia, catch a moment together, while waiting for the opening ceremony of the WEF in Ho Chi Minh city, in 2010. 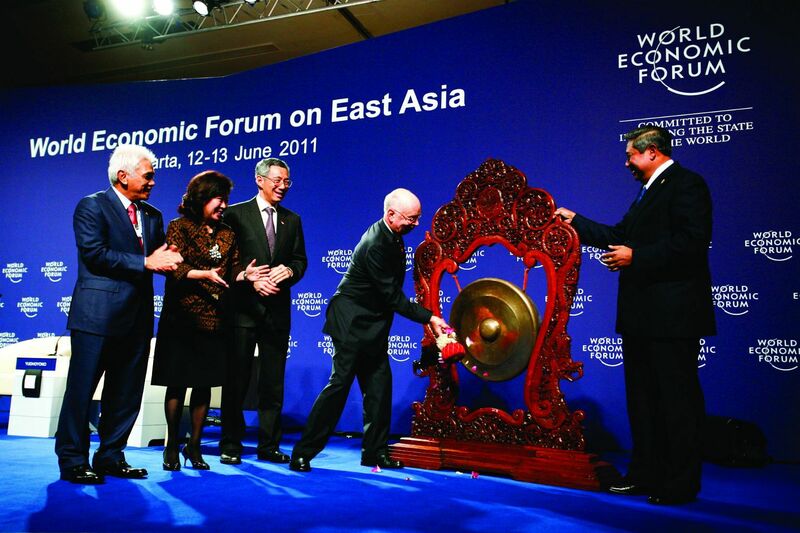 Klaus Schwab, Executive Chairman of the World Economic Forum signals the opening of the WEF meeting in Jakarta in 2011, in a traditional gong ceremony. 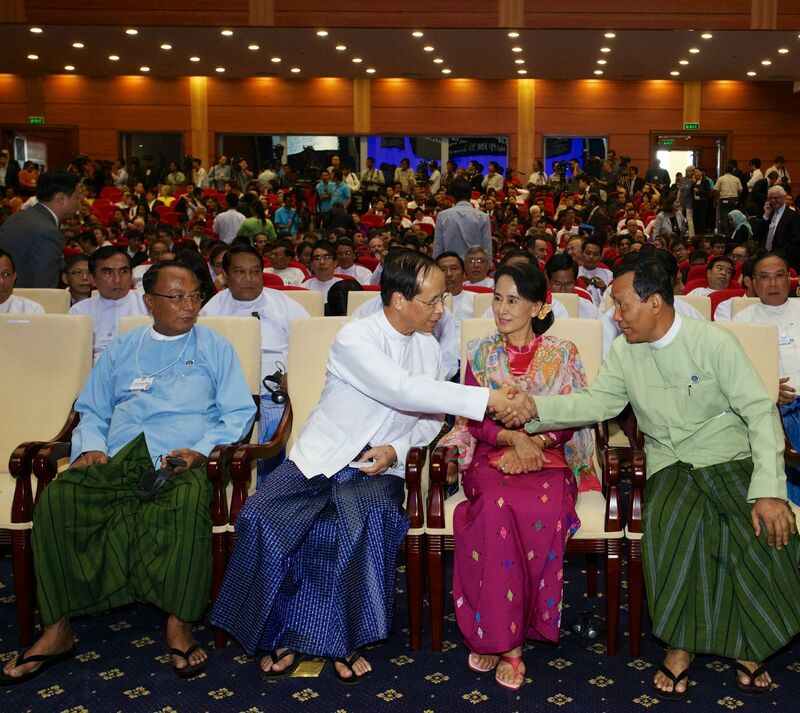 U Khin Aung Myint, Speaker of the House of Representatives, Sai Mauk Kham, Vice President, Aung San Suu Kyi, Chairwoman, National League for Democracy and Shwe Mann, Member of Parliament, Myanmar greet each other before the opening ceremony of the WEF in Myanmar, in 2013. 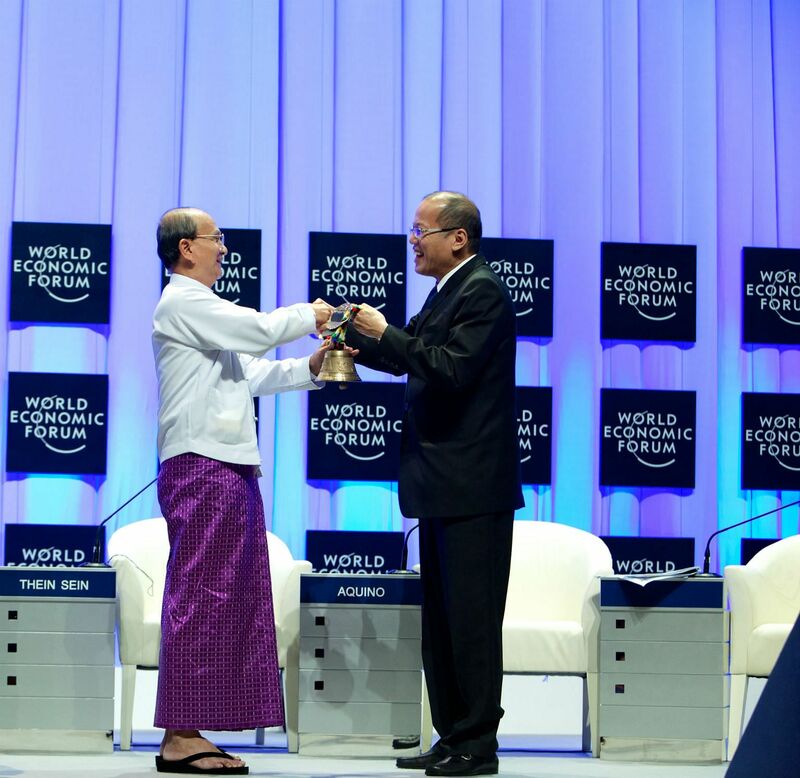 Thein Sein, President of Myanmar hands over the ceremonial Swiss bell to Benigno Aquino, President of the Philippines at the closing ceremony at the WEF meet in Yangon, in 2013. Manila hosted the next WEF meet. 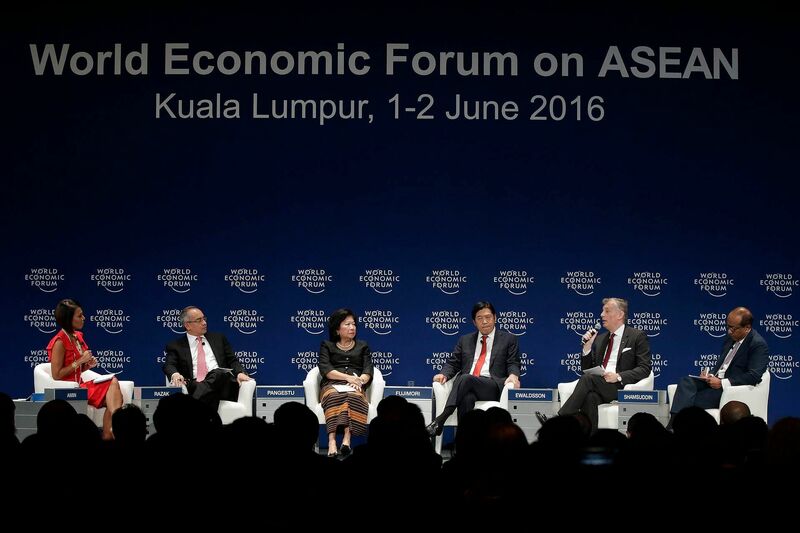 A session in progress at the current WEF meet in Kuala Lumpur in June 2016.